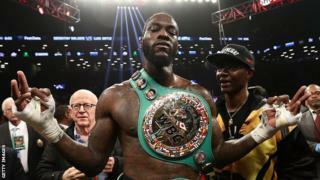 Deontay Wilder beat Luis Ortiz in March to retain his WBC heavyweight titleWBC heavyweight champion Deontay Wilder says it is "time to make the fight" between him and WBA, IBF and WBO title holder Anthony Joshua.Joshua's promoter Eddie Hearn has said the WBA has ordered the Briton to enter into negotiations with mandatory challenger Alexander Povetkin. "This is the biggest fight in world boxing," said American Wilder. Speaking to Behind the Gloves,[/i] he added: "We would rather have this big fight. "Joshua, 28, added the WBO title to his IBF and WBA crowns with a unanimous points win over New Zealander Joseph Parker earlier this month.Regarding Povetkin, his options are either to arrange a bout, vacate the belt or agree a deal that would see the 38-year-old Russian temporarily step aside and challenge him at a later date so he could fight Wilder.A bout between Joshua and Wilder would result in the first man to hold all four major heavyweight titles.Wilder, 32, has said he is happy to travel to the United Kingdom to fight Joshua but added that he thinks the Briton's camp may use the mandatory challenger as a way to "dodge" him. "When Eddie wants an end-of-the-year fight, what he's trying to do is put another fight in place before getting to me," said the American. "What makes sense to me, and the entire world, is having a summer fight [and then] a rematch end-of-the-year fight. "I go over to England, whoop AJ and at the end of the year we come to Vegas - or wherever makes sense - and have a great Merry Christmas and a Happy New Year. That sounds beautiful. "He added: "We all know that Deontay Wilder wants the fight. Why would I shy away from it? "They do not want this fight. Everything that has been going on that's been slowing up this fight has been on their behalf. "Don't let them fool you. At the end of the day it is Joshua's decision. Do they work for him or does he work for them?"